The purpose of this case report is to describe the management of an adolescent patient with missing mandibular second premolars and retained mandibular second primary molars. A 14 year old female patient was referred to the department of Conservative dentistry and endodontics from the department of Orthodontics of SubhartiDental College. The patient complained of irregular teeth. On clinical examination, there was crowding in the mandibular anterior region with discrepancy in tooth size and jaw size for which she was undergoing fixed orthodontic mechanotherapy. Also, there were retained mandibular deciduous second molars bilaterally, which were free from caries. There were no swelling, sinus and mobility. Intraoral periapical radiographic examination revealed the absence of permanent second premolars bilaterally. The roots of the mandibular deciduous second molars did not show any sign of resorption or periapical or furcation associated rarefication. Vitality test were performed and the results were positive. The treatment plan was made to preserve the deciduous molars and to manage space by hemisectioning the deciduous molars. On the first appointment, local anaesthesia with adrenaline was administered by inferior alveolar nerve block. Mandidular right deciduous second molar was isolated, access opening was made and the canals were located. The pulp was extirpated and working length of the distal canals were determined using radiographic and electronic methods. The distal canals were instrumented with rotary protaper files (Dentsply) with sodium hypochlorite as an irrigant. Glyde (Denstply) was used as a lubricant. The canals were prepared upto F1 and obturared using corresponding protaperguttapercha points (Dentsply). The access cavity was then restored with composite. A flap was raised to expose the furcation area. A tapered fissure bur of sufficient length was used to cut from the mid point of the buccal aspect to the lingual midpoint through the furcation. The direction of the cut was verified radiographically using radiovisiograph. The cut was then extended through the pulpal floor and into the undersurface of the crown. The mesial half was then luxated and removed. On the next appointment, the same procedure was repeated for the mandibular left deciduous second molar. On the subsequent appointments, both the teeth were prepared to receive full coverage restorations and a porcelain-fused-to-metal crown shaped as mandibular second premolars were luted [Figure 1]. The patient was then referred back to the department of orthodontics for correction of crowding. The patient was followed up for two years and two year follow up photograph showed both deciduous molars in place. 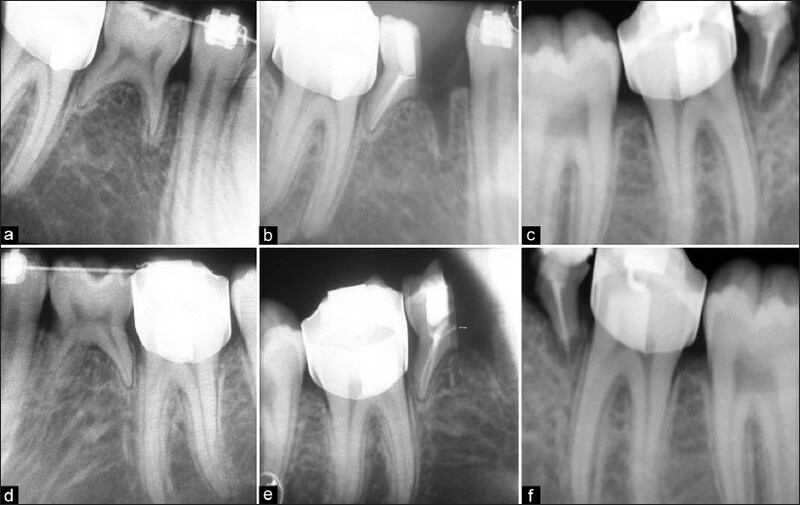 The two year follow up radiographs [Figure 2] showed slight apical resorption of the roots of retained deciduous molars. The patient was advised to go for placement with implants after three years. If we aim for long term aesthetic results, the controlled slicing of the second primary molar is a good option for treating patients with congenitally missing second premolars as it removes obstacles which could compromise the final occlusion such as the need for prosthetic replacement. Maintaining the space by retaining the deciduous molar, especially when an implant is planned for the future, will often compromise the occlusion due to the differences in crown height and crown length. In subjects with agenesis of the second mandibular premolar teeth, the primary molar may be left in situ. Ostler and Kokich investigated the changes in ridge width over time in patients with congenitally missing second premolars. Their findings indicated a 25% decrease in ridge width within 3 years after deciduous molar extraction. Also, greater buccal ridge resorption(74%) was seen compared with resorption on the lingual side (24%). This could jeopardize the success of implant placement in the future and require bone grafting. Hemisection preserves the buccolingual ridge and prevent the formation of a lateral buccal bony depression . Those investigators concluded that retaining a healthy primary mandibular second molar is a viable treatment alternative. Therefore, in conclusion, it can be said that retention of healthy deciduous mandibular second molars after hemisection of the deciduous molars is a viable treatment alternative, especially in cases with anterior crowding which require orthodontic space management. 1. Valencia R, Saadia M, Grinberg G. Controlled slicing in the management of congenitally missing second premolars. Am J OrthodDentofacialOrthop 2004;125:537-43. 2. Newman GV, Newman RA. Report of four familial cases with congenitally missing mandibular incisors. Am J OrthodDentofacialOrthop 1998;114:195-207. 3. 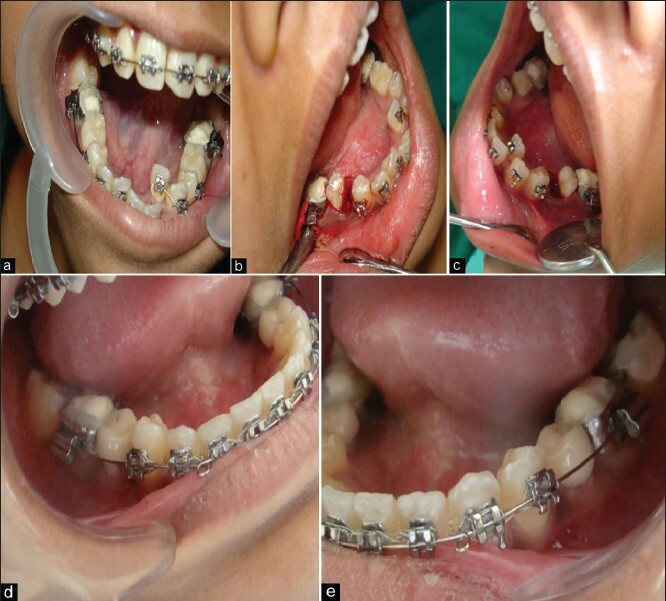 Mamopoulou A, Hagg U, Schroder U, Hansen K. Agenesis of mandibular second premolars, spontaneous space closure after extraction therapy: A 4 year follow up. Eur J Orthod 1996;18:589-600. 4. Biggerstaff RH. The orthodontic management of congenitally absent maxillary lateral incisor and second premolar: A case report. Am J OrthodDentofacialOrthop 1992;102:537-45. 5. Haskel EW, Harold RS. Vital hemisection of a mandibular second molar: A case report. J Am Dent Assoc 1981;102:503-6. 6. Papandreas SG, Buschang PH, Alexander RG, Kennedy DB. Physiologic drift of mandibular dentition following first premolar extraction. Angle Orthod 1993;63:127-34. 7. Northway WM. The nuts and bolts of hemisection treatment: Managing congenitally missing mandibular second premolars: Am J Orthod Dentofacial Orthop 2005;127:606-10. 8. Uner O, Yucel-Eroglu E, Karaca I. Delayed Calcification and congenitally missing teeth. Case Report. Aust Dent J 1994;39:168-71. 9. Ronnerman A, Thilander B. A longitudinal study on the effect of unilateral extraction of deciduous molars. Scand J Dent Res 1977;85:362-72. 10. Swessi DM, Stephens CD. The spontaneous effect of lower first premolar extraction on the mesio-distal angulation of adjacent teeth and the relation of this to extraction space closure in the long term. Eur J Orthod 1993;15:503-11. 11. Ranly DM. A synopsis of craniofacial growth. New York; Appketon-Century-Crofts; 1980. 12. Bjerklin K, Al-Najjar M, Kårestedt H, Andrén A. Agenesis of mandibular second premolars with retained primary molars. A longitudinal radiographic study of 99 subjects from 12 years to adulthood. Eur J Orthod 2008;30:254-61. 13. Sunitha V R, Emmadi P, Namasivayam A, Thyegarajan R, Rajaraman V. The periodontal - endodontic continuum: A review. J Conserv Dent 2008;11:54-62. 14. Ostler MS, Kokich VG: Alveolar ridge changes in patients with congenitally missing mandibular second premolars. J Prosthet Dent 1994;71:144-9. 15. Garib DG, Zanella NL, Peck S. Associated dental anomalies: Case report. J Appl Oral Sci 2005;13:431-6. 16. Bjerklin K, Bennet J. A long term survival of lower second primary molars in subjects with agenesis of premolars. Eur J Orthod 2000;22:245-55. 17. Sletten DW, Smith BM, Southard KA, Casko JS, Southard TE. Retained deciduous mandibular molars in adults: A radiographic study of long term changes. Am J OrthodDentofacialOrthop 2003;124:625-30. 18. Sharma A. A rare case of concomitant hypo-hyperdontia in identical twins. J Indian SocPedodPrev Dent 2008;26:79-81. 19. Das G, Sarkar S, Bhattacharya B, Saha N. Coexistent partial anodontia and supernumerary tooth in the mandibular arch: A rare case. J Indian SocPedodPrev Dent 2006;24:33-4. 20. Manjunatha BS, Nagarajappa D, Singh SK. Concomitant hypo-hyperdontia with dens invaginatus. Indian J Dent Res 2011;22:468-71. 21. Suprabha BS, Sumanth KN, Boaz K, George T. An unusual case of non-syndromic occurrence of multiple dental anomalies. Indian J Dent Res 2009;20:385-7.